So Josh and I went to Dallas to nab Tony Dorsett. We thought that by leaving a few hours early, it’d get us a decent place in line. We got lucky. Encountering 2 hour delay due to an overturned semi on I-35, we arrived with only an hour and 15 minutes before the event. Still we hopped in line and took our place 3 quarters of the way around the building. I have never been to a ‘Star Power’ location. I probably would never go there again. Glitz, glamour, and a lot of the usage of the word ‘affluent’ to put off anybody who would ask, “How much is this?” It screamed of excess and the place flat out embraced it. To them, most of us who showed up were just a working class sideshow at the event. In my time collecting, I have never been as incensed by the amount of flagrant double-dipping going on. There is no need for you to get your children to go and get the same item signed. 3 Tony Dorsett helmets, with one for each kid who didn’t care about football or who they were meeting. It was just so obvious that there was a lot of people getting paid for this and that there was going to be an Ebay flood of items later that day. Tony Dorsett was a one man dynamo for Pitt from 1973-1976, leading the school to a National Championship, Heisman accolades, and was the all-time leading rusher in college history with 6,082 yards. A first round choice of the Cowboys (#2 overall) in 1977, he won NFL Rookie of the Year Honors with 1,007 yards and 12 TDs. Over the course of his 11 year career in Dallas, Dorsett was named All Pro 4 times and won a Super Bowl title. He also holds the NFL record for longest TD run with a 99 yard gallop against the Minnesota Vikings in 1983. 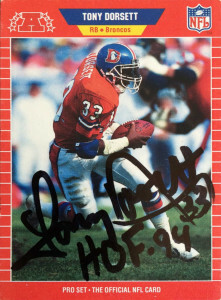 As injuries began to take their toll on the venerable back and the arrival of fresh legs in the form of Herschel Walker in 1987, Dorsett was traded to the Denver Broncos in 1988 playing one season before he retired. At the time of his retirement, Dorsett was the second All-Time leading rusher in NFL history, and of a less distinguished note, was top 5 in fumbles with 90. He is the only player in NFL history to win the Heisman, and then win the Super Bowl and NFL Rookie of the Year the following season. To top it all off, Tony was inducted into the Pro Football Hall of Fame, the College Football Hall of Fame in 1994, and had his number retired at Pitt. Dorsett is one of the major names that has come out in regards to concussion litigation against the NFL. Tony in particular has suffered so many concussions he lost track. He suffers from memory loss, depression, and dementia due to CTE. He was not in in great shape when I saw him, but Tony very graciously stayed over his appointed time to get everybody knocked out who was in line. He signed this one card for me, and tried to interact with every fan he met.